Amazon will end 2018 capturing about 48 percent of U.S. e-commerce sales, or $252 billion, compared with 43.1 percent in 2017, according to a study by eMarketer. 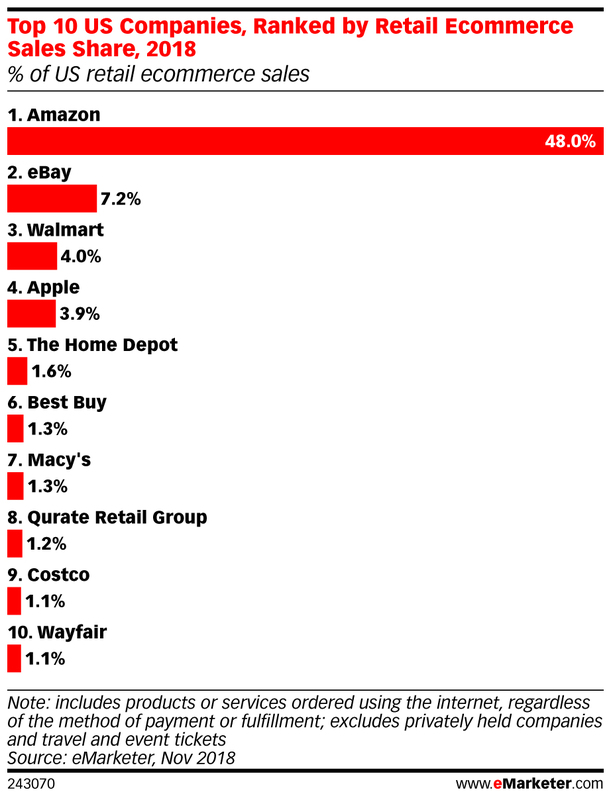 Walmart and Target are both competing to take more online sales as well. Walmart CEO, Doug McMillon (L), Amazon CEO, Jeff Bezos (C) and Target CEO, Brian Cornell. Retailers such as Walmart and Target have been pouring money into their online businesses to fend off rival Amazon as the companies look to capture an even greater share of U.S. e-commerce sales. Target offered the perfect example of that Tuesday, when its shares fell more than 10 percent after third-quarter earnings missed Wall Street expectations, thanks to increased transportation and labor costs, as e-commerce sales swelled. It was on track to lose more than $4.4 billion in market value. "Some people are worried that this is as good as it gets," Telsey Advisory Group analyst Joe Feldman told CNBC. "Comparisons are also getting tougher going forward." As Walmart's e-commerce sales continue to climb, delivery and other expenses will continue to weigh on margins, unless Walmart can find a way — like adding more private labels — to make up for that. Walmart's $16 billion acquisition of Indian e-commerce company Flipkart has also hurt profits in the near term. With its growth, however, Walmart is poised to overtake Apple to become the third-biggest U.S. retailer in terms of e-commerce sales by the end of this year, eMarketer said. The firm has predicted Walmart will capture 4 percent of all online retail spending in the U.S. this year, or $20.91 billion. Further down on the list in 11th place, behind eBay, Best Buy and Macy's, Target is expected to capture 1 percent of U.S. e-commerce sales, or $5.25 billion, by year's end. "Amazon remains the king of e-commerce and is in no danger of losing its crown anytime soon," said eMarketer analyst Andrew Lipsman. "But online competition from brick-and-mortar retailers is heating up and Amazon has felt more of a need to respond to maintain its leadership." Overall, U.S. e-commerce sales are forecast by eMarketer to climb 16 percent in 2018 to $525.69 billion, making up 9.8 percent of total U.S. retail sales. — CNBC's Sarah Whitten and Christopher Hayes contributed to this reporting.